Sooo delicious! 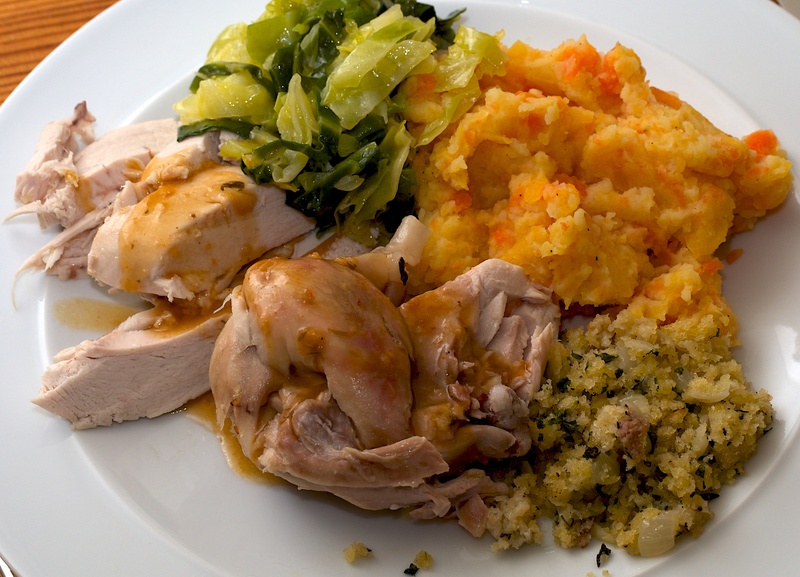 We never tire of variations on a roast chicken dinner and the potatoes are the best bit here which doesn’t take away from the delicious chicken! This variation has been made multiple times in our kitchen which says something as we’re always trying something new. You need to roast chicken for 20 minutes at 190C/375F/gas 5 for each 500g, plus an extra 10 minutes. Wine Suggestion: a rich white is the business with chicken, and Chardonnay is the usual go-to variety. For this dish, however, we’ve successfully opened oaked Godello from Spain, the Dominio de Tares Bierzo; and an oaked Alvarinho from Portugal, the Soalheiro Alvarinho Reserva. Both brought delicious nuances to the chicken and are really worth seeking out. Season the outside and the cavity of the chicken. Put half a lemon and a few bay leaves inside and place in a very large roasting tin. Drizzle some olive oil over the skin, squeeze over the other lemon half and roast for about 1 hour and 50 minutes. Cut 2 of the lemons into wedges and put in a bowl with the onions, potatoes and garlic cloves. Add some olive oil, salt and pepper, ½ tbsp dried oregano and the juice of half a lemon. Toss everything together until well coated. 45 minutes before the roasting time is up, put the vegetables around the chicken, sprinkle another 2 tsps of oregano over the top and return to the oven. 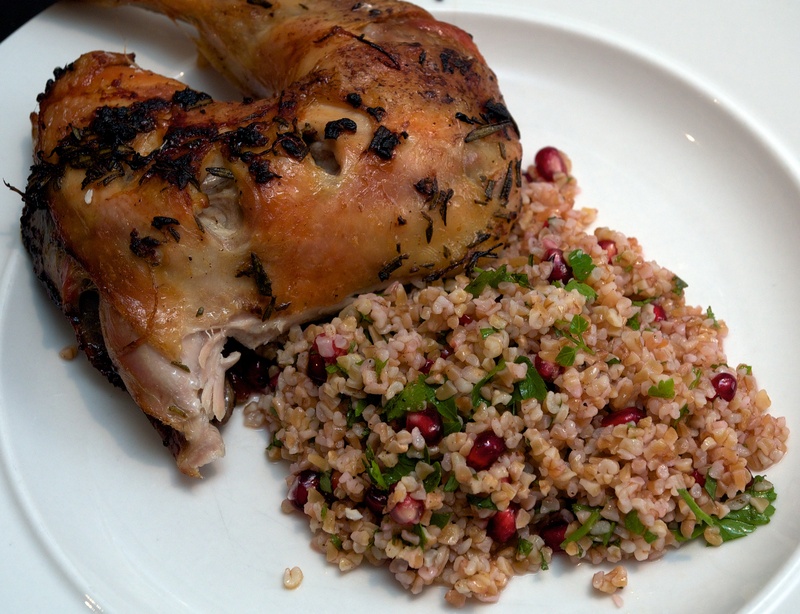 This tastes just as good as a cold chicken and bulgur salad the following day – great for lunchboxes! Wine Suggestion: we drank a delicious Fiano made in Puglia by Michele Biancardi. It had delightful layers of fruit, texture from spice and minerality and a dancing freshness that worked well with the roasted chicken and still allowed the freshness of the salad to shine through. We suspect the depth and personality of this wine is helped by the biodynamic viticulture as it just had “something” extra without being weighty and forceful. If you can’t find this one do look out for Fiano, an interesting Italian white that you might not have tried. To spatchcock the chicken you need to first remove the backbone by cutting through the chicken on both side of the bone (use poultry shears if you have them or really sharp scissors). Remove the backbone and open the chicken out, then put the chicken, breast side up, onto a worktop and use your palms to flatten it. Make a few slashes in the legs with a sharp knife. Make the marinade by mixing all of the ingredients in a bowl and seasoning well with sea salt and black pepper. Put the chicken into a wide, shallow dish, pour over the marinade and rub in well with your hands. Cover with cling film and chill for at least 2 hours. Put the chicken into a roasting tin along with all the marinade and bake for about 1 hour or until cooked through (the juices need to be totally clear when pierced with a skewer and the legs should feel loose). Meanwhile, cover the bulgur wheat with boiling water and leave to soak for 10-15 minutes or until just soft, then drain. Mix the lemon juice and zest with the pomegranate seeds and juice, herbs and olive oil. Stir in the bulgur and season well with sea salt and black pepper. When the chicken is cooked, cover with foil and leave to rest in the tin and leave in the switched off oven for a few minutes, then carve in to pieces and serve with the salad. This roast chicken was inspired by Darina Allen, who had a new method for keeping the Chicken skin moist – using butter soaked muslin. It works excellently so we’re converts to this technique! Preheat the oven to 180ºC/350°F/gas 4. Make the stuffing: sweat the onions gently in the butter until soft, then take off the heat and stir in the breadcrumbs, herbs and some seasoning. Leave to cool. Season the inside of the chicken, then half-fill with the cold stuffing. Put the rest of the stuffing into the neck end. Weight the chicken and calculate the cooking time (15 minutes per 450g and 15 minutes over). Melt 4 tsp butter and soak a large piece of muslin in the melted butter, cover the chicken completely with the muslin and roast for the calculated time. You can take the muslin off for the last 10 minutes if you want the skin really brown. Check that the juices are running clear when pierced with a skewer, then leave to rest. To make the gravy: spoon off any surplus fat from the roasting tin. De-glaze the pan juices with the stock and use a whisk to to stir and scrape the caramelised bits from the bottom of the tin. Boil it up well, season and thicken if you like (we like it runny). 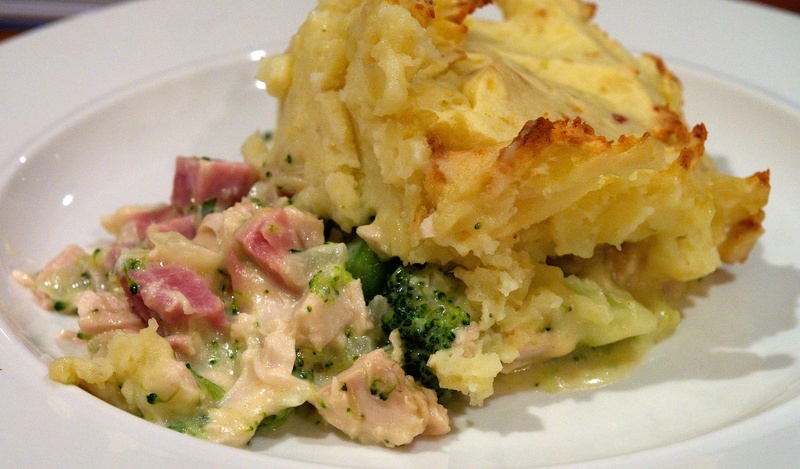 Serve with greens and mash. Wine Suggestion: Oaked white wines go well with roast chicken with Chardonnay being the obvious pick. We were a little extravagant and had a superb Chardonnay / Auxerrois blend from Zind-Humbrecht in Alsace. It’s a Vin de Table as Chardonnay is not an authorised grape for the region and as the wine is all about texture, minerality and structure , pushing the boundaries a lot, you could argue it is controversial on tasting as well; we thought it superb and thought provoking. As it opened up in the glass over the meal it worked better and better, matching flavours, complimenting them and adding nuances. The wine: Zind Z010 (obviously 2010 vintage, but Vin de Table wines are not allowed to say anything about vintage or region on the label).